In 2013, the Icelandic Tax Liberation Day is, according to calculations made by the Young Independents, on July 7th. This is the day when people can start to work for themselves and are liberated from having to work any longer for government. In Iceland, people now have to pay a little more than 50% of their revenues to government. 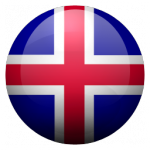 The RNH celebration of the Icelandic Tax Freedom Day is a part of a joint project with AECR, the Alliance of European Conservatives and Reformists. The think tank New Direction with which RNH cooperates also celebrates a Tax Liberation Day in Europe, calculating it slightly differently. It is a well-established fact that high taxes reduce the propensity of people to work and to create wealth. Tax rises may increase tax revenue in the short run, but in the long run they may reduce it because the tax basis will contract. This can be seen by comparing Sweden and Switzerland, two affluent countries which in the 20th Century largely escaped the ravages of war or military occupation. In 1990, the tax rate in Sweden was 52.3% of gross domestic product, GDP, while 25.9% in Switzerland. 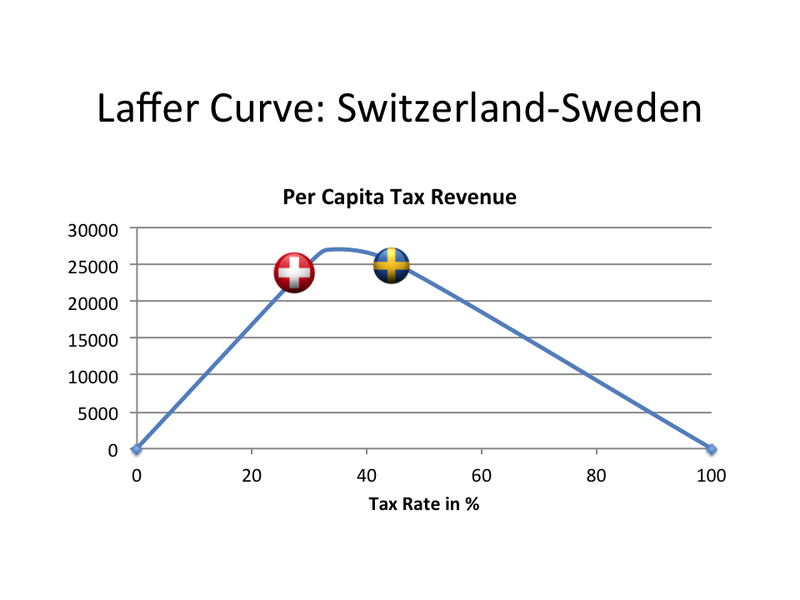 Tax revenue per capita was in Sweden $14,923 and in Switzerland $9,061. If the relationship between the tax rate and tax revenue had been linear (i.e. 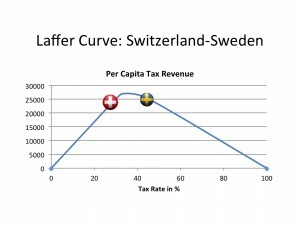 the tax base not susceptible to change), then tax revenue per capita should have been double in Sweden what it were in Switzerland, as the tax rate was double. In 2011, the tax rate in Sweden was 44.5% of GDP, while 28.5% in Switzerland. But tax revenue per capita was nearly the same in the two countries, $25,361 in Sweden and $23,948. In other words, almost the same tax revenue could be achieved by a tax rate of 28.5% and 44.5%. The so-called Laffer Curve illustrates the fact that at 0% tax rate, the tax revenue is zero, $0; and that it goes up with an increased tax rate until it reaches some highest possible level, after all it falls again, and at an 100% tax rate it is also zero, $0: nobody bothers to work in the legal and taxed economy if all his or her income is expropriated. Professor Birgir Thor Runolfsson of the University of Iceland, a member of RNH’s Council of Academic Advisers, has drawn a “Laffer Curve” with the 2011 data from Sweden and Switzerland, although of course such a curve is meant to demonstrate a general truth rather than to reflect the economic reality at any given point in time. It should also be noted that Sweden has been reducing the tax burden significantly, having adopted “The New Swedish Model” described at an RNH meeting 14 January 2013 by Dr. Nils Karlson of Ratio Institute in Stockholm. It was a good sign that the first public event the President of Iceland participated in after the Icelandic Tax Liberation Day was on 9 July 2013 to sign into law the proposal significantly to lower the special tax imposed by the Radical Left government of 2009–2011 on the fisheries. 20 September 2013, Matthew Elliott of the British Taxpayers’ Alliance will give a talk in Reykjavik, co-sponsored by RNH and the Icelandic Taxpayers’ Alliance. The publishing house Almenna bokafelagid will also soon publish a collection of papers on taxation and the distribution of income, edited by Professors Ragnar Arnason and Birgir Thor Runolfsson.